iderdider....: soon and very soon. I don't remember the last time I nursed Claire. She slipped from baby to big girl and I didn't even write it down. Her weaning happened so gradually that it was entirely painless. Each night before she goes to bed, I think this could be the last night with just the three of us. Only so far, it hasn't been. We get one more marathon of huggies and stories and songs. One more night of her asking for a big kiss and a little kiss Nacho Libre-style. One more night before she has to share us with someone new. Someone new, who like her sister, will come when he's ready. Someone who will hopefully inherit my ability to smile for a camera and not his father's. 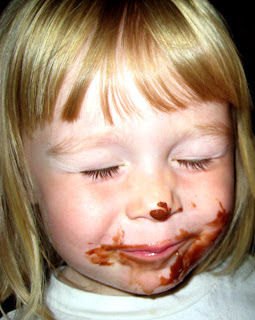 Ha - I like how Claire's shirt appears to be clean, even though the face is covered in brownie batter. :) Why waste it by getting it on your shirt? She's one smart cookie...er, brownie. And just think of it this way...you get to be a cute pregnant lady just a little longer than you expected. I heard you went into labor early this morning. I don't know if there's another little Curtis yet or not! Still praying for you!! I just heard too! Oh, I'm doubly praying for you tonight!!! Much love my friend! Good luck my friend. I can't wait to see pictures. Oh, Kari, I'm so glad I caught this...Ronald is actually ME Valerie!!! I'm in California using my parents' computer. I didn't realize I was logged in as my dad!!!!! I'm so very excited to hear what happened/what's happening!! I had a dream last night you had a wonderfully successful vaginal birth and were planning on going to church on Sunday!!!!! I look forward to hearing your birth story!